Our changing climate presents significant challenges for mining companies and governments that are responsible for regulating the industry. 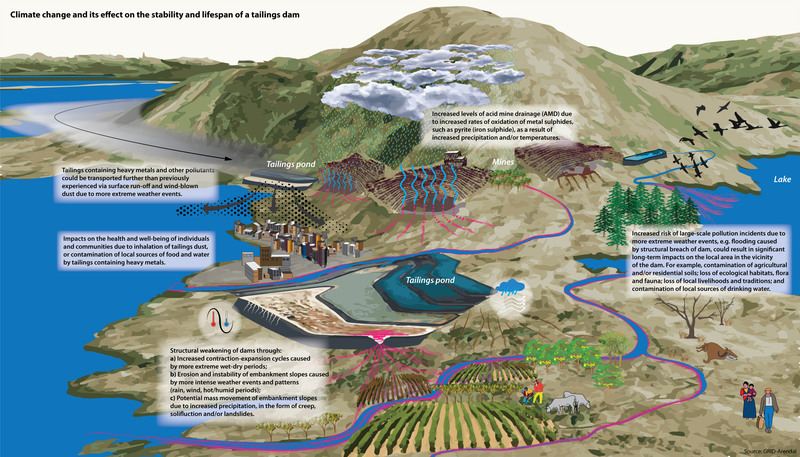 Increased climate variability and extreme weather events have not necessarily been considered in the design and construction of existing tailings dams. Planning for an uncertain climate future is now an essential part of risk management. Heavy rain has been implicated in 25 per cent of global and 35 per cent of European tailings dam failures (Rico et al. 2008). With the increasing uncertainty around climate change, the planning of tailings dams will have to factor in this uncertainty and the associated risks. Reliable data are essential in developing a life-cycle plan for current and future operations that incorporates climate change adaptation. By utilizing the existing climate projections, coupled with good planning and a zero-risk approach, it may be possible to mitigate against climate-related changes and construct safe and responsible tailings storage facilities.